Situational awareness: It costs you time, not money. But some Uber and Lyft drivers are "longhauling — taking an unnecessarily longer route to a destination" so they're paid more by the companies (although the rider pays the app's estimate of the ideal route), per The Wall Street Journal (subscription). Chicago doesn't have the highest homicide rate, but the Windy City consistently had more total killings than any other U.S. city — with 27 people killed since the beginning of the month, Axios' Stef Kight and Michael Sykes report. Why it matters: Racial segregation, wealth inequality, gangs and the inability of law enforcement to solve crimes have fueled the gun violence epidemic. A handful of minority, impoverished neighborhoods have received the brunt of the impact. Despite a barrage of carnage the past two weekends, gun-related homicides this year have actually dropped since the spikes in 2016 and 2017. But 2018 still has the third highest number of homicides of the past 15 years for the city. Chicago is flourishing economically, with a record-low unemployment rate of 3.8% and a third of its residents making at least $100,000. But the wealth is not equally distributed over the starkly segregated neighborhoods — and neither is the violence. Lack of resources and opportunities often lead young people in poor communities to turn to violence, community leaders and gun regulation advocates tell Axios. This is evident in the 12 poor, minority neighborhoods which account for 50% of Chicago's shootings — often attributed to gang activity — according to a study by Northwestern University. 34% of African-Americans in Chicago live in poverty, compared to 21% for Chicago overall, per the Census Bureau. There were 215 shootings in the Austin neighborhood on the West Side of Chicago in the first seven months of the year — almost 12% of the total number of shootings in the city during the same time period, according to data from the Chicago Tribune, Chicago Sun-Times and others. Adam Alonso, the executive director of BUILD Chicago, told Axios that children in neighborhoods like Austin walk out of the house with the belief "they might not make it back home." 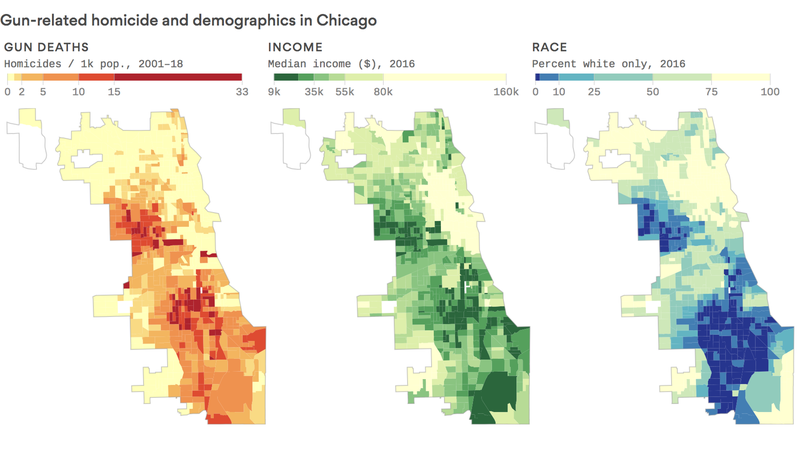 The median income in the majority-African-American neighborhood is $20,000 less than the median income for Chicago, and almost a third of the neighborhood's residents live below the poverty line, according to City-Data.com. Go deeper: There are organizations with members who are dedicating their lives to making life in Chicago better for those in poverty. Axios' Alexi McCammond identified the five tightest House races in the country — the true coin flips — and they're all seats held by Republicans. The races are in Iowa, Florida, Texas, California and Maine. The Maine district may boot an incumbent for the first time in a century. Why they matter: They're the ideal place for Democrats’ blue wave to crash in 2018. They’ve kept their GOP reps over the years, but have been slowly shifting toward Dems — as seen in the way the district voted in 2016, in the incumbent Republican's last margin, or in support for the Democrat in the primary. Iowa's 3rd district: It's held by Republican Rep. David Young, who Kyle Kondik of Larry Sabato's Crystal Ball calls "an accidental incumbent." Young was selected to run at a convention in Iowa in 2014 after getting less than 35% of the vote in the primary. Democrats think Cindy Axne — who got 58% of the vote in her primary and is backed by the Democratic Congressional Campaign Committee — is a strong candidate for them. Florida's 26th district: It went for Clinton by 16 points in 2016 despite keeping Republican Rep. Carlos Curbelo in office for the last four years. A majority of the district's residents are Hispanic, and both Curbelo and his likely Democratic challenger, Debbie Mucarsel-Powell, have Hispanic heritage. Texas' 23rd district: It's considered a perpetual swing district. Republican Rep. Will Hurd only won re-election by 1.3%, and he has distanced himself from Trump. He's facing Gina Ortiz Jones, who could be the first woman to represent this district. California's 48th district: This is the seat held by Republican Rep. Dana Rohrabacher, who's facing uncomfortable questions about his relationship with Russia. It has been a reliably red district, but it went for Clinton in 2016, and a recent poll put Rohrabacher and Democrat Harley Rouda in a dead heat. Not only is Orange County becoming increasingly diverse, but the number of registered Republican voters has consistently declined. Maine's 2nd district: Republican Rep. Bruce Poliquin represents a district that has "a strong union Democratic heritage but a proud independent streak," writes Cook Political Report's Dave Wasserman. The district hasn't ousted an incumbent in 102 years. But Poliquin's seat is now considered a coin flip because his challenger, Democratic state Rep. Jared Golden, is considered "Maine's version of Conor Lamb." Be smart: No one we talked to could think of an incumbent House Democrat who's in trouble. Eight in 10 Americans say 3D-printed gun blueprints shouldn't be available on the internet — a rare consensus on gun policy that cuts across party and ideological lines, according to a new Axios/SurveyMonkey poll. The big picture, from Axios managing editor David Nather: The poll shows Americans are still more divided on other gun issues. A slight majority disapproves of President Trump's overall gun policies, and his approval rating on guns is similar to his overall job approval rating. 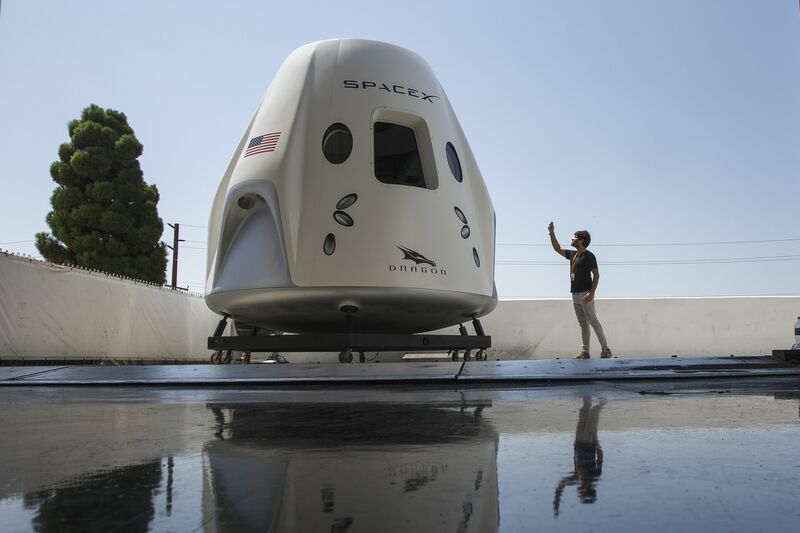 A reporter takes a smartphone photo of a mock-up of the Crew Dragon spacecraft during a media tour yesterday of SpaceX headquarters and rocket factory in Hawthorne, Calif.
SpaceX plans to use Crew Dragon to carry NASA astronauts to the International Space Station. Per SpaceX: "Crew Dragon was designed to be an enjoyable ride. With four windows, passengers can take in views of Earth, the Moon, and the wider Solar System right from their seats, which are made from the highest-grade carbon fiber and Alcantara cloth." "The way you press, scroll and type on a phone screen or keyboard can be as unique as your fingerprints or facial features. To fight fraud, a growing number of banks and merchants are tracking visitors’ physical movements as they use websites and apps." "Using sensors in your phone or code on websites, companies can gather thousands of data points ... to help prove whether a digital user is actually the person she claims to be." "Some use the technology only to weed out automated attacks and suspicious transactions, but others are going significantly further, amassing tens of millions of profiles that can identify customers by how they touch, hold and tap their devices." Why it matters: "The data collection is invisible to those being watched." Be smart: "Banks and merchants sometimes store their customers’ biometric data internally. In many cases, though, they allow the outside vendors they work with to hold it. That magnifies the risks." 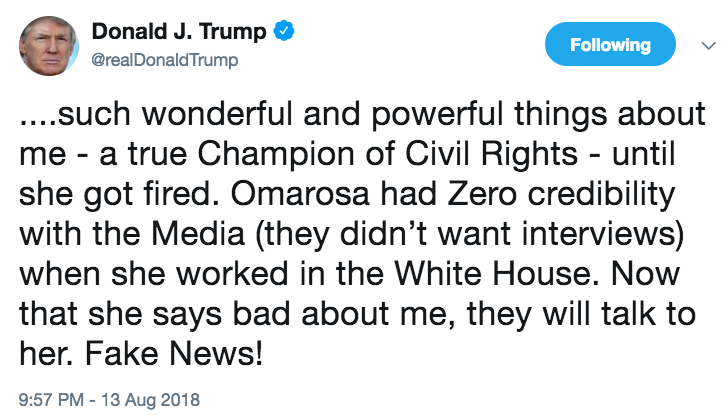 "Donald Trump and I used to talk a lot about Omarosa Manigault Newman. ... He was fascinated by her self-absorption and nastiness, fascinated by her fleeting star power and fascinated by the fact that she was publicly recognizable by her first name alone, sort of like Prince or Madonna." 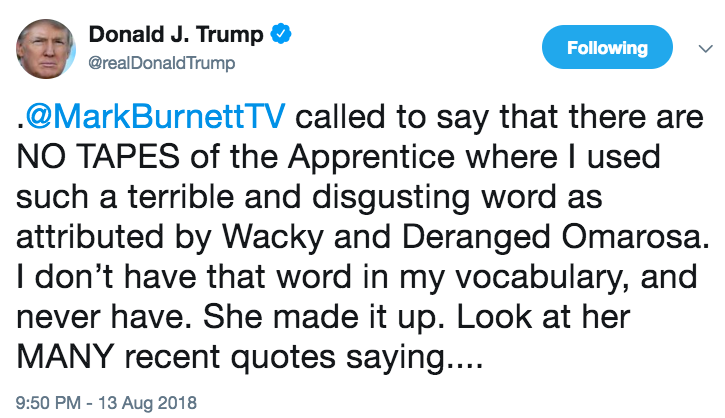 Why it matters: "Trump has always unleashed demons in people around him, even in orbits as cartoonish as 'The Apprentice' and the Trump Organization. It made for boffo TV." "Other great powers are contesting U.S. digital leadership, pushing their own national priorities. Security threats appear and evolve constantly. Platforms that were supposed to expand and enrich the marketplace of ideas have been hijacked by trolls and bots and flooded with disinformation." "And real power is increasingly concentrated in the hands of a few private tech giants." Why it matters: "Whatever emerges from this melee, it will be different from, and in many ways worse than, what we have now." 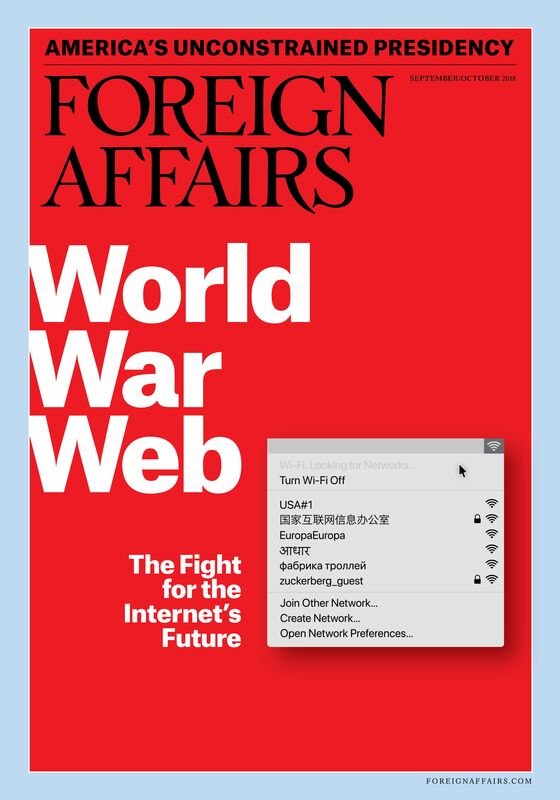 "Battlefield Internet: A Plan for Securing Cyberspace," by Michèle Flournoy and Michael Sulmeyer. "At a Trump administration event focused on developing more health-care apps, companies including Amazon, ... Google and Microsoft Corp. said they would 'share the common quest to unlock the potential in health care data, to deliver better outcomes at lower costs.'" Why it matters: "The Trump administration sees better use of health-care data as a key to unlocking savings and holding down costs while improving outcomes." Seema Verma, administrator of the Centers for Medicare and Medicaid Services, which convened yesterday's Blue Button 2.0 Developer Conference: "We want to lean into technology and use it as a potent force to create more efficiencies in our system." White House senior advisor Matt Lira statement: "Today’s announcements represent a watershed moment toward fostering more innovation in America’s healthcare systems." 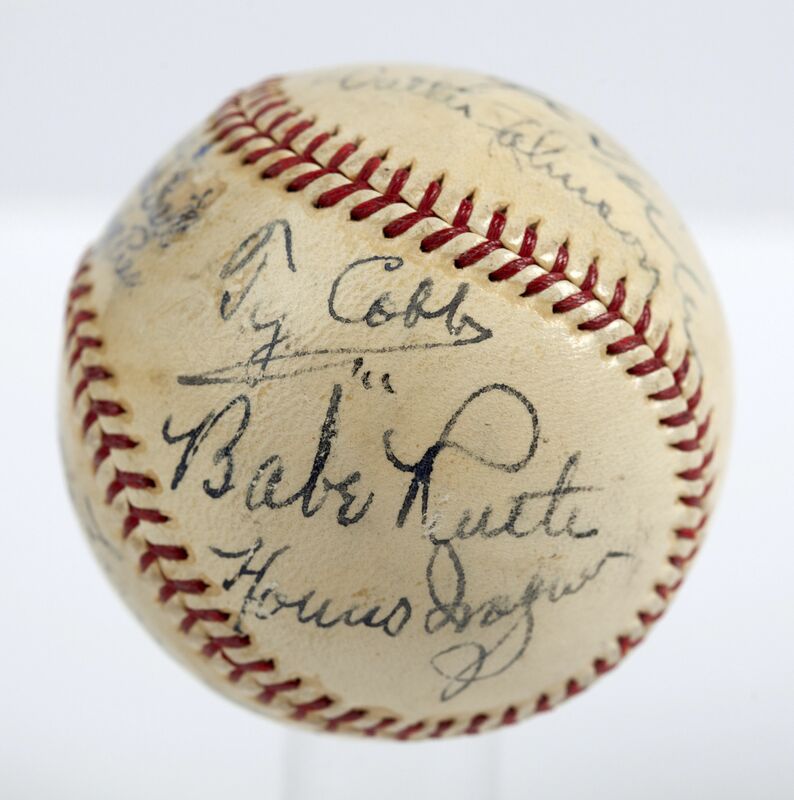 A baseball signed by Babe Ruth, Honus Wagner, Ty Cobb, Cy Young, Tris Speaker, George Sisler, Walter Johnson, Connie Mack, Nap Lajoie, Eddie Collins and Pete Alexander — in 1939, at their induction ceremony into the Baseball Hall of Fame — just sold for $623,369, AP's Andrew Dalton reports from L.A.
"That crushes the record of $345,000 for a signed baseball, set in 2013 for a Ruth-Gehrig ball." The only original inductee who was living at the time "who didn't sign the ball was Lou Gehrig, who on that day was headed to the Mayo Clinic ... [H]e'd been diagnosed with ALS, the disease that would end his career, take his life and unofficially bear his name." 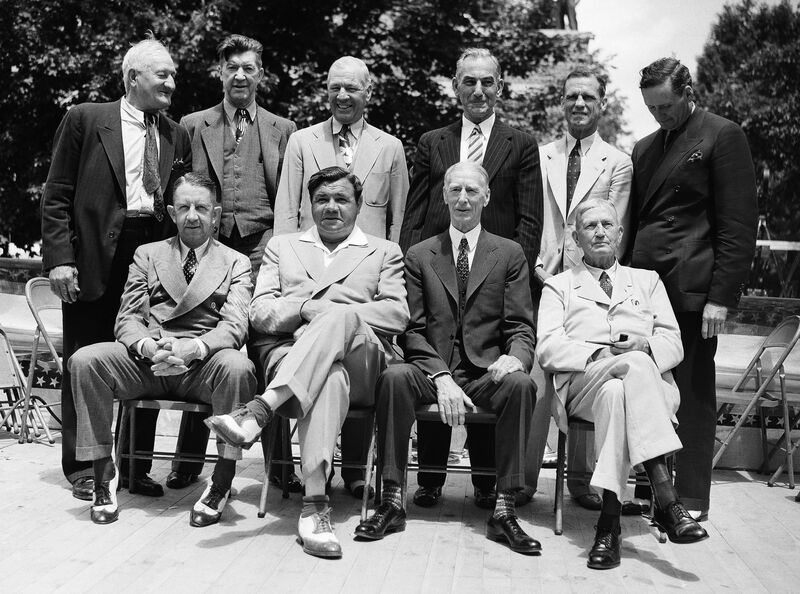 The class of classes ... On June 12, 1939, legends line up at the first induction ceremony of the Baseball Hall of Fame in Cooperstown, N.Y.
Front row, left to right: Eddie Collins, Babe Ruth, Connie Mack, Cy Young. Rear row: Honus Wagner, Grover Cleveland Alexander, Tris Speaker, Napoleon Lajoie, George Sisler and Walter Johnson. Performix House is a "new gym near Union Square where wannabe members must undergo a rigorous application process" that includes a check of the applicant's Instagram feed to see "how they live their life." "Membership is available in three tiers, at costs of $250, $400 and $900 per month." "[F]or some members, many of whom are fitness influencers, the big draw is a content studio, with lights and four cameras, where they can tape workouts and share them on social media." Tonight on Axios.com, we'll have live results from primaries in Wisconsin, Minnesota, Connecticut and Vermont.